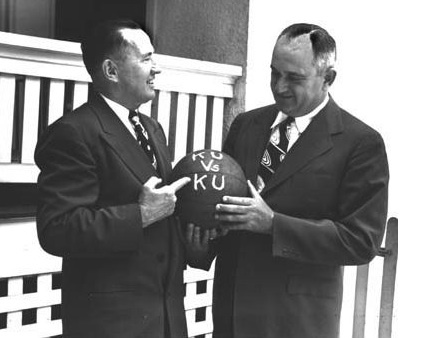 Phog Allen of Kansas (KU), Adolph Rupp of Kentucky (UK), and a very confusing ball. Maybe the inscription referred to the fact that Rupp was a KU graduate. Maybe UK used to be called KU. Or maybe it had something to do with Bronze Age pagan rituals and the summer solstice. At 345 of Division I’s 351 member institutions, the commonly accepted abbreviation of the school’s name preserves the sequence of the words being abbreviated. Take for instance the case of two Big Ten flagship universities in adjoining states that each begin with the letter “I.” “The U of I” denotes the University of Illinois, while “IU,” indubitably enough, refers to Indiana University. Basically this is a proven system of human discourse, but try telling that to the brazen abbreviation-inverting iconoclasts sprinkled thinly across our nation’s Great Plains. Out there between the Mississippi River and the Rockies, all abbreviation heck breaks loose. Usage can always make the strange seem inevitable, but if you think about it this really is pretty striking. No one refers to General Motors as “MG,” Upper Peninsula native Tom Izzo doesn’t claim to be from “the PU,” and the United States has never been the “SU.” So how, exactly, did “KU” and its ilk come to pass? One explanation that has perhaps been given a little too much credence is that this was somehow a “Big Eight thing,” and that in the 1960s the late lamented conference may have even required their “University of (State Name)” members to go with the “U” at the end. The first problem with this telling of the story is the presence of the University of Denver, known colloquially as “DU.” Denver was never a member of the Big Eight and thus was not subject to its decrees. The Pioneers just came up with the nutty abbreviation on their own. Second, several ends-in-U inversions had been in use for decades before the 1960s. “KU” was being bandied about in Lawrence by the 1880s; Oklahoma was rendered as “OK U” by 1905 and as simply “OU” by 1936; and “CU” was doing its work in Boulder no later than the 1940s. (In the 1950s there was a concerted effort made at Colorado to henceforth refer to the university as the “U of C” but, needless to say, that push did not succeed.) Perhaps the Big Eight really did send out a memo in the 1960s, but at best the league officials were recognizing a terminological fait accompli. Maybe there’s no Rosebud here, and perhaps the true origin of inverted university abbreviations (and the allied question of why all such inversions were coined within a stone’s throw of the 100th Meridian) really is “unknowable.” But, what the heck, here are two reckless yet mutually compatible theories just to get the wild-speculaion ball rolling. 1. If ESPN and the Internet had existed in the 1880s, and Jayhawks of that era had been exposed to a steady diet of references to the “U of This” or “UThat,” abbreviation history may have taken a different turn. Instead, the earnest students in Lawrence were left to their own devices at a time when the naming conventions for large institutions with a capital-U “University” in their title were still very much in flux. Inversion ensued, and it’s possible that the likes of Oklahoma and Colorado took their cues here from Kansas. 2. Ends-in-U abbreviations are easy to vocalize, rhyme and sing. “Rock Chalk Jayhawk, KU” sounds good, and it ends with a long vowel that reverberates well in field houses or even in a domed football stadium with a raised basketball floor on the field. Eric Havelock would approve. BONUS philological mayhem in the Cornhusker State! There is something of a war going on for the soul of the University of Nebraska’s abbreviation right now, and it’s not yet clear which side will win. For one thing the school’s url is actually http://www.unl.edu and a visit there confronts you with “The University of Nebraska-Lincoln” in 40-point type. That’s notable, because pretty much everywhere else in the United States universities absolutely despise hyphens and indeed go to great lengths to suppress them — witness for example the vogue for rechristening repentant former hyphenates as things like “Omaha” or “Green Bay.” Then there’s the matter of the Huskers’ conference affiliation. When Nebraska joined the Big Ten, fans of Northwestern University were quick to insist that their school was the real “NU” and indeed to ask what was up with this whole weird inversion thing anyway. This entry was posted in philological click-bait on October 31, 2013 by johngasaway.